Home » Blog » How is your Balance? Balance is important. On many fields of life: It’s important to have balance between work and free time, balance on a bank account and balance in motion. And it is trainable. On all these fields. For an agility handler a good balance results as a good performance on course and makes the training safer. The turns on a course are often sudden and fast and puts your balance to the test. Balance as an ability. It is the result of coordination of a number of body systems: the eyes (visual), ears (vestibular) and the body’s sense of where it is in space (proprioception). The system activates the muscles and joints to maintain orientation and balance. With a strong core and legs, especially strong ankles, the handler will be more likely to prevent falling and sprains and is more able to concentrate on learning the handling itself. 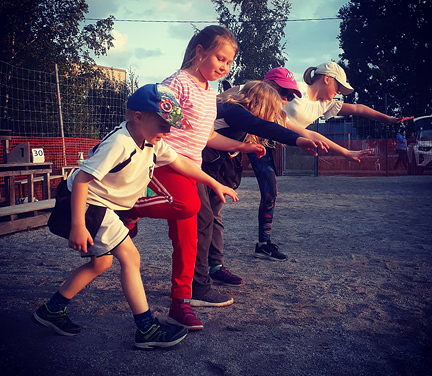 As children are still developing their balance, we do a lot of balance training among different body control exercises through fun and games in Funna® lessons.